One of the things we pride ourselves on is our ability to create a true family at Trail’s End. We tell our campers and staff that “you are never just passing through.” Whether you are a lifer who started as a Buddy or Ranger, or you spent a single summer at TEC as a counselor, when you enter our gates you are forever part of the Trail’s End family. 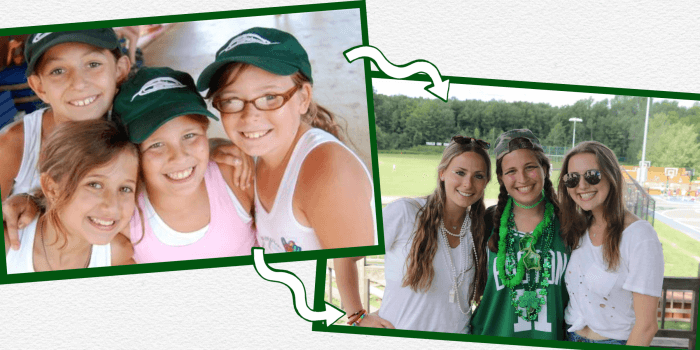 She came to camp in 2008 as an Upper Buddy and never left, returning summer after summer and ultimately completing her camper years as a Leadership Trainee in 2015. We were then fortunate enough to have Lindsay work for two summers as a Trail’s End counselor. Lindsay had to make the challenging decision not return to TEC this upcoming summer to pursue other opportunities. 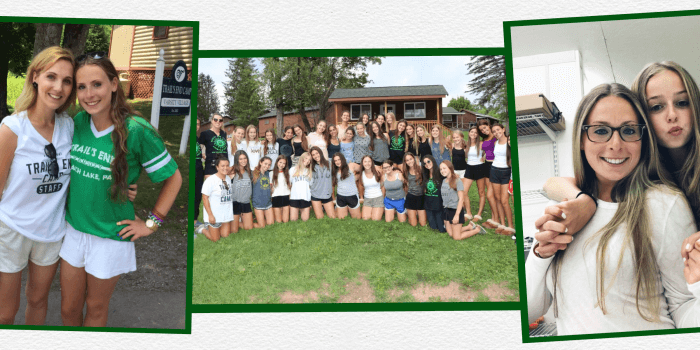 When she realized she would not be able to spend the summer in Beach Lake, PA, Lindsay sent us a message reflecting on the TEC experience and how her summers at Trail’s End Camp have deeply impacted her life. She was kind enough to let us share her thoughts with you. 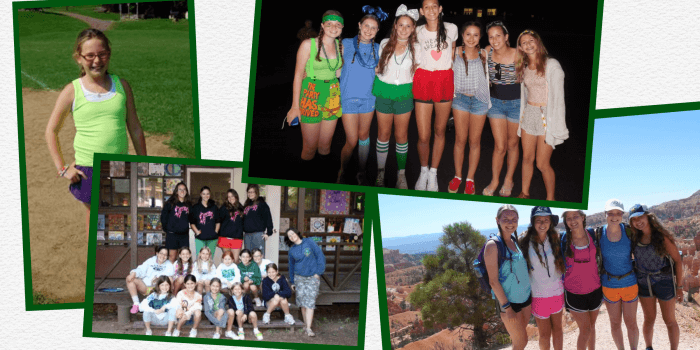 “The girls that I worked with and camp have taught me so many things and so many life lessons and I will always be grateful for the impact Trail’s End has on me. I honestly cannot put into words how special camp is – I’m sure you’ve heard that a million times before. It’s given me my best friends, my bridesmaids, my fake little sisters and memories that I will remember forever. I hope one day I can return to camp because every day I think about 18405. Trail’s End will always hold a special place in my heart because it is a part of who I am. Little did I know in 2008 when I hopped off the Livingston 1 bus as an Upper Buddy how lucky I was to be able to call Trail’s End my home and how much this place would mean to me. Thank you for introducing me to Emily Wexler and Sydney Kayne in 2008, Jess Ehrlich in 2009, Samantha Kramer in 2010, Faye Sheffield in 2012 and Molly Shapiro in 2018. All of these people and more have come into my life and will forever be my lifelong friends because of Trail’s End. Not only have the people I met impacted me, but the place has as well. There is something magical in the air that makes everyone happy, be their true self, and never feel judged. I have never been so comfortable around complete strangers in my entire life and Trail’s End has taught me to be myself and to embrace my weird, fun, silly side but also my serious, “normal” side. There are no words to describe how thankful I am for this special place in Beach Lake, Pennsylvania. Trail’s End has not only impacted my life but my family’s. You have given my sister her best friends and a place that she can be herself also. I have never seen her smile as much ever in my entire life than I do at camp. I remember her first Visiting Day when you guys had to pull her off the tree sideways because she wouldn’t let go of my parents. I also remember having to do that same thing to her in 2017 when she was an LT. Trail’s End is the place she feels the most comfortable and is the happiest I have ever seen her. My parents always tell us when we got off that camp bus we had that Trail’s End smile, the smile that was pure, genuine, and full of happiness. I hope that every camper and counselor realize how lucky they are to be a part of something bigger than themselves and a part of our secret club because it is not common that people have something this special to them. Once again, thank you for everything that you and Trail’s End have done for me, my sister and my parents. I wouldn’t be the person I am today and I really truly am forever grateful for finding a place that is more than just a summer camp, but an experience of a lifetime. Thank you to Lindsay for reaching out to share how much Trail’s End Camp means to her (and the many others that have spent a summer or more in Beach Lake – 18405). 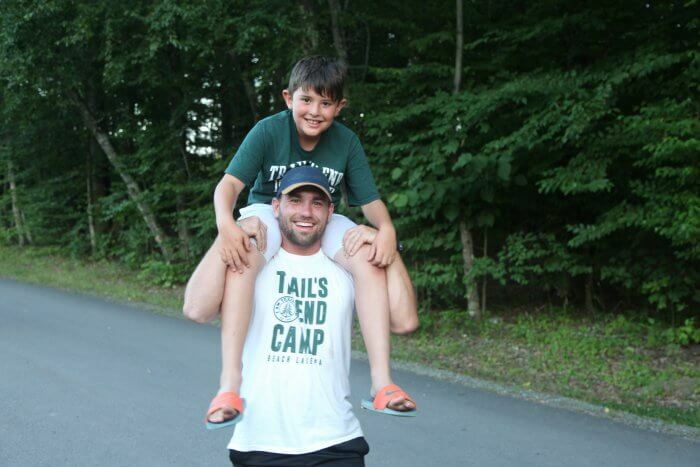 If there is anything you would like to share about your time at Trail’s End Camp, send an email to marc@trailsendcamp.com. We love hearing from our campers and staff, both old and new! This entry was posted in Uncategorized on March 9, 2019 by Marc Honigfeld. 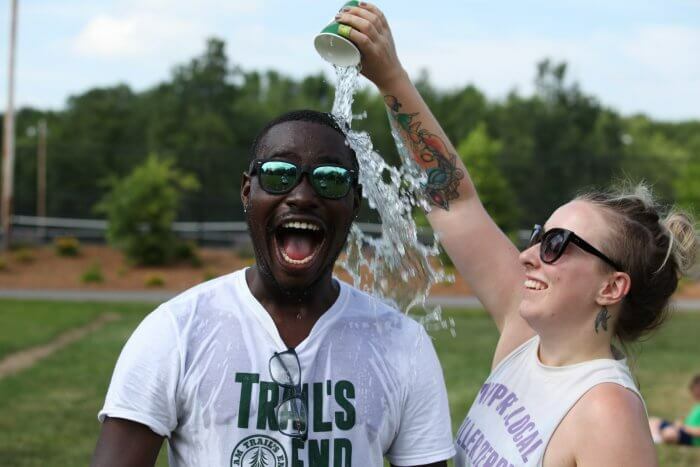 Best Job Ever: 5 Reasons Why You Should Work at Trail’s End Camp! At Trail’s End Camp we like to say “you’re better for having been at TEC”, and that adage doesn’t just apply to our campers! We strive to ensure our staff family is happy and thriving throughout the summer and beyond. Now, if you’ve never been a camper or worked at a summer camp before you may be asking – Why should I work at Trail’s End? What makes the TEC Experience different from other camps? We asked your questions to our TEC staff family who couldn’t wait to tell you why they love working at Trail’s End. Here are some of their answers! You’ll be part of traditions that began in 1947! Even as we prep for our 72nd camp session, we still hold on to traditions from Trail’s End’s first summers. From Sing, to Olympics, to the creation of bunk plaques, and more – Trail’s End Camp wouldn’t be the same without these special traditions. When you enter the gates of Trail’s End, you’re immediately part of a long history. 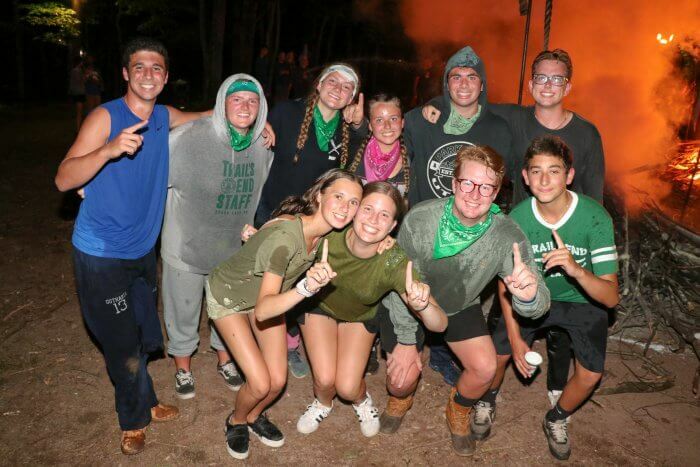 When you take part in the Opening and Closing Campfires, run the bases on College Day, or cheer for your campers as they sing on stage during the 4th of July show, you quickly see how you’re now part of the fabric of Trail’s End Camp. It’s an amazing feeling to be part of something so special! 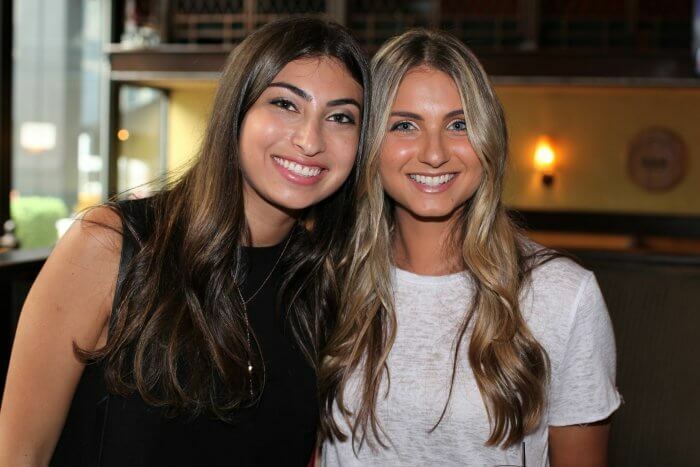 You’ll make lifelong friends with people from all over the world! You may enter your first summer not knowing anyone, but after Staff Education Week you will have developed friendships that last a lifetime. Just take a look at all the #TECreunions we post on social media. You’ll find pictures of TEC staff visiting each other, going on vacation together, and in some instances, even getting married! You never know who you’ll meet while working at Trail’s End Camp! You’ll make a positive impact on a group of campers! You are better for having been at TEC! Yes, you’ll improve the life of the campers you work with, but you will experience some self improvement of your own. Working at a summer camp helps you develop vital skills that will help you throughout your life, such as leadership, teamwork, and communication. Maybe this is why more and more people are championing camp jobs over traditional summer internships, or why businesses see the benefit in hiring a former camp counselor! 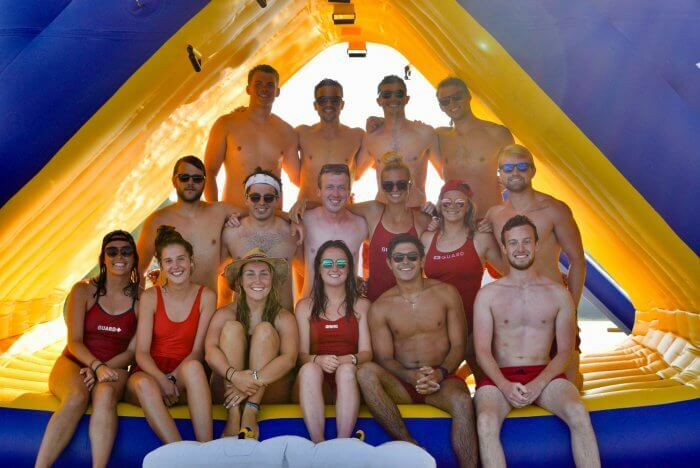 We can tell you all the ways working at a TEC will benefit you as a person and allow you to become part of a camp family that stems all the way back from 1947, but there’s one important thing we can’t forget — working at Trail’s End Camp is tons of fun! 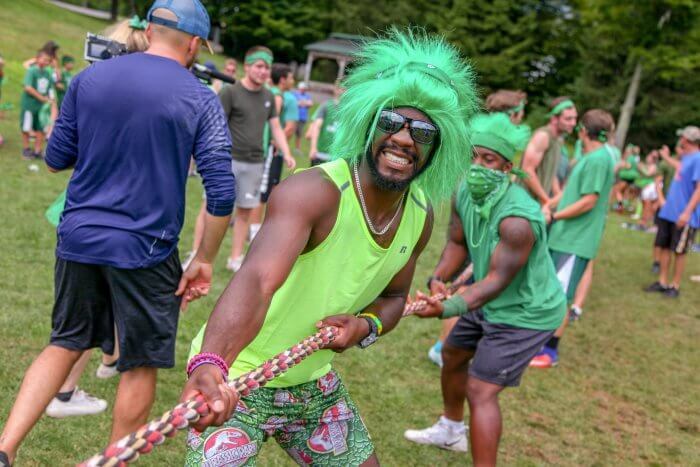 A day at TEC can involve playing sports, dressing up in wild outfits to perform in a lip sync competition with your co-counselors, taking part in a giant food fight, doing your craziest dance moves in the dining hall, and laughing till your stomach hurts. How many other summer jobs can boast all of that?! After all of that, we know what you’re going to ask next! How do I join the Trail’s End Camp staff family? This entry was posted in Uncategorized on January 25, 2019 by Marc Honigfeld. While camp lasts only 51 days, the bonds we make at Trail’s End extend well beyond the day the buses depart. Throughout the off-season, we love seeing and hearing about all your TEC get-togethers. As 2018 comes to an end, we feel very grateful for all of the wonderful Trail’s End memories and friendships that we made this year. 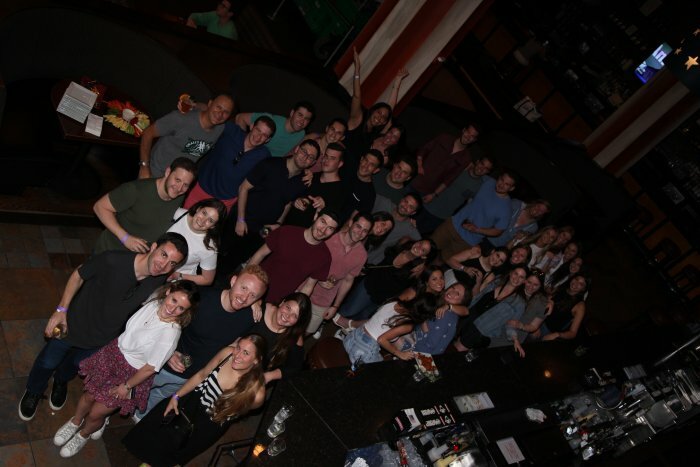 This past weekend, campers came together to reunite with old friends and to start to form bonds with those new campers that will be experiencing TEC for the first time next summer. On Saturday, our 2019 Debs, Kadets and Lowers reunited at Bounce Trampoline Sports. From the moment they arrived, it was as if we were back in 18405 with lots of smiles and laughter all around us. 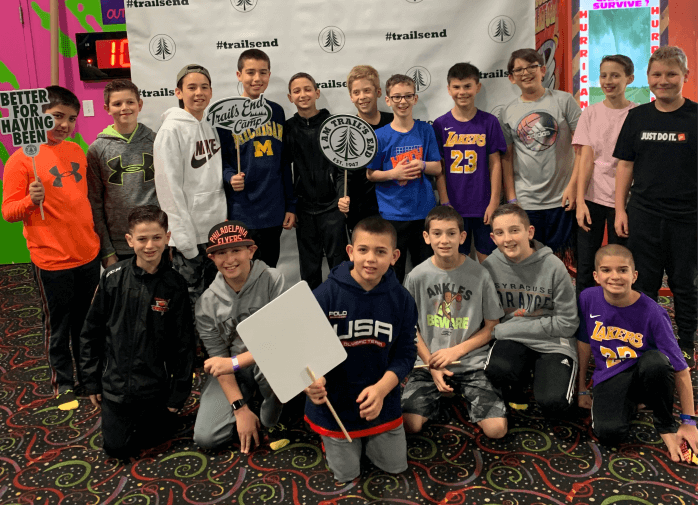 The youngest TEC campers met up on Sunday for bowling, pizza, and group games – the boys started off the day and the girls followed in the afternoon. 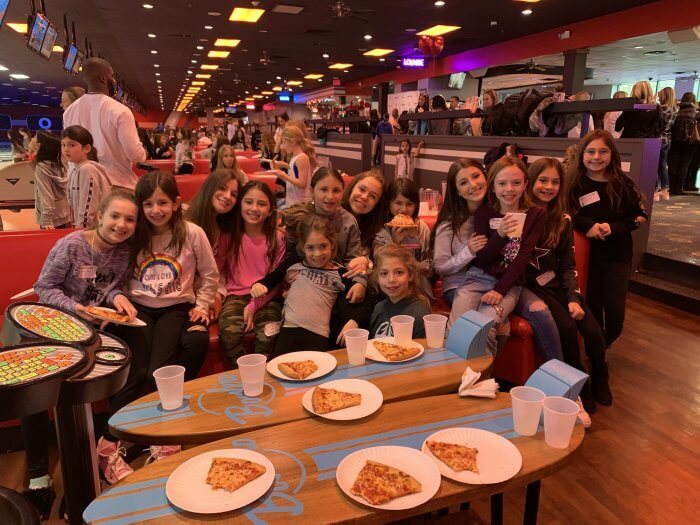 The bowling party is one of our transition events which allow new campers to get comfortable and start to develop friendships that will help them to succeed next summer. For our returning campers, we are amazed how welcoming they are as they help the first-time campers become a part of the TEC family. We also want to thank our staff who play such a large role in facilitating the ice breakers and helping to make the connections of new and returning campers. Of course, there’s no better way to end a Trail’s End reunion than with a few raffles! Some lucky campers went home with brand new TEC swag, while others won great prizes for their bunk. Winning bunks will be enjoying pizza and ice cream parties, counselor clean-ups, and late wake-ups with breakfast in bed. Please mark your calendar for the next get-together in Florida on Sunday, February 17th. We will also have the Varsity Reunion for our oldest campers in NYC on Saturday, February 3rd. Invites for both events will be sent by email next week. Wishing everyone a happy, healthy, and peaceful New Year. Only 27 Saturdays until Opening Campfire! This entry was posted in Uncategorized on December 11, 2018 by Marc Honigfeld. What does it mean when we say “Better for Having Been”? There are so many ways spending summers at Trail’s End makes us the best version of ourselves. Anyone who walks into the gates is forever changed for the better. At camp, children gain emotional, social and physical skills while learning from positive role models. Now, imagine a world where every child can go to camp, regardless of background. This is exactly what SCOPE is trying to make happen. 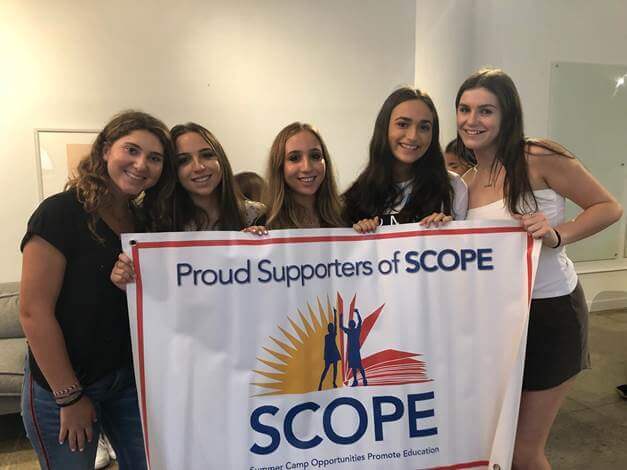 SCOPE (Summer Camp Opportunities Promote Education) is a nonprofit organization that provides “camperships” for children from low income families and underserved communities. These camperships let children who need it most experience the magic of summer camp. 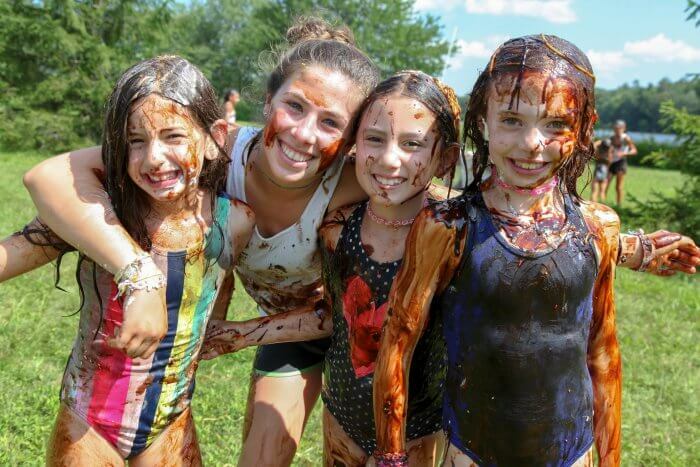 This past summer, 750 campers between the ages of 7-16 were able to attend camp through SCOPE. Trail’s End Camp has partnered with SCOPE for years. Marc was previously the president of the SCOPE board, and Sara is currently a member of the SCOPE Associate Board. We’re proud to say we even have Trail’s End campers on the SCOPE Junior Leadership Council! We caught up with Taylor Seid, Leadership Trainee ‘18 and member of the SCOPE Junior Leadership Council, to see what inspired her to help kids experience the magic of summer camp. Trail’s End Camp partners with SCOPE as part of our TEC Cares program. TEC Cares works to give back to the broader community, while instilling the values and importance of giving back in our campers. We’re better for having been at Trail’s End Camp, and we want to help more kids be better for having been offered opportunities through SCOPE camperships. Want to help children experience the magic of camp? SCOPE is launching their Smore4SCOPE campaign this Giving Tuesday! On Tuesday, November 27 you have the chance to help give even more children the summer camp experience.